2. Extratech's new 1:72 SA-315 'Lama', #72002, comes with French, Argentinian & Chilean markings. 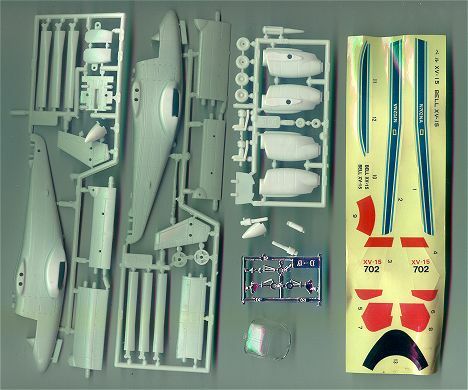 While there are many parts common to the Extratech Alouette II, the differences evident from the box-art are the high skids, the different engine and rotormast, the upwardly angled tail-boom, and the three-bladed tail rotor. 3. Released this week is Revell's Agusta A109KM Koala 'Military', #4456. This is believed to come with decals for a South African Army aircraft. 4. I have confirmation from several Brazilian sources that Italeri's Exocet-equipped Brazilian Super Puma, kit #002, is a work of pure fiction. Brazil's Sea Kings can carry Exocets, but their Super Pumas / Cougars have never done so. 5. Eduard's second etched brass set for the Italeri/Revell H-21 is now available. This is #72-322, and covers the exterior. The interior detail comes on #72-317 which was released a few weeks ago. 6. Hobbylink Japan are listing a 1:48 JMSDF Kawasaki OH-6D from Hasegawa, #09342, presumably a re-issue of Hasegawa's previous MDD 500 kits. 7. Steve Coates has just finished his magnum opus on German Helicopters, and delivered it to the publisher Classic Aviation. I'm told that this book will be the definitive guide to the development and deployment of German Helicopters from 1934 to 1945 and their post-war testing in various countries. The book will be around 450 pages and will feature over 600 photos, most of which have never published before. The book is a labour of love by Steve who has spent the last 20 years researching, including interviews with surviving designers and pilots to get their first-hand accounts. The book will also feature detail drawings by Arthur Bently. The detail cutaway drawings Arthur is doing on the Flettner Fl-282 will be used in the planned restoration of the Midland Air Museum's Fl-282B airframe (prototype V20 CJ+SN, Werknummer 282000020). Classic Aviation plan to release this book in 2002, so you have time to start saving up for it now. 8. Continuing this theme, see also Scott Van Aken's 'Modeling Madness' review and build of the 1:48 Special Hobby Flettner Fl-265. F-40 Flugzeug Der Bundeswehr #37 covers the Westland Sea King Mk.41, 128 pages. 'History of the XV-15 Tilt Rotor Research Aircraft'. I believe the last two are not yet available, but soon will be. This gives me an excuse to mention one of the more unusual helicopter kits, an excellent little snap-kit of the Bell XV-15 with adhesive vinyl markings in about 1:85 scale. I am told that this was originally produced in Japan as a novelty give-way to accompany some item of confectionery. The rights to it were subsequently acquired by Bell Helicopter, who used it as a promotional item. If any reader knows any more about the history of this kit, I'd be glad to hear from them. This last is Rich Dann's HSL-43 Det.2B 'Dolan's Dogs' BuNo 162991, as featured in his recent Squadron/Signal Walk Around #5519. Hawkeye are also listing some of the products recently announced by The Aviation Workshop HKN #83, but under their own numbers. I have tried to list only those which are entirely new but the situation is increasingly confusing - in my opinion the two vendors would be well advised to put their heads together and come up with a unified numbering system for their jointly marketed products. Email enquiries about Hawkeye products can be directed to The Aviation Workshop. Thanks to Pete Tasker, Steven Evans, Gary Webster, and Alexandre de C. Triffoni.